What distinguishes the Rojava Revolution from some other revolutions are the difference in the mentality; the mindset, and the Self Administration that has been working since its onset to satisfy the needs of citizens, protect the land and safeguard the rights of the people as much as possible, in spite of the limited resources. As the revolution enters its sixth year, we would like to shed some light on the achievements of this revolution in the public service sector, the economy and the environment. Th Ba’ath party adopted many policies in building factories in Rojava, never giving permission to build any unless it suited its own agendas and interests, and that made the regions of Rojava reliant on imports of manufactured products from the interior cities of Syria, like Aleppo and Damascus, or from abroad. This led the prices to go up, and caused unemployment and emigration. These policies were made systematically in order to subordinate and undermine people. The economic situation deteriorated in most regions of Syria due to the path that the Syrian revolution took: foreign aggression, the repressive policies of the regime, the brutality of the mercenaries of Daesh [ISIS], the exploitation of the situation for private gain in the vacuum in security by certain individuals who hid behind the disguise of the ‘revolution’ and stole the natural resources. People in Syria suffered in combat zones, where the economy collapsed, diseases and famine became widespread, and hundreds of thousands of people emigrated to safe areas in Rojava, where the situation was still under control with the efforts of the people who kept it safe, and deterred attacks of the mercenaries. After the announcement of the Democratic Self Administration in 2014, institutions were organised and local councils and committees were formed which concentrated their efforts on the economic situation in the region. One of the missions of the Economic Committee was to support the agricultural, industrial and commercial projects throughout Rojava, with the aim of reaching self-sufficiency, curbing monopoly and exploitation, reducing unemployment and activating the work force, both male and female. Women’s economy… a communal economy. Women play a prominent role in the Rojava Revolution, proving their ability to work in politics, economy and the military. They have striven to bring the economy back to its communal nature, to benefit society and reject monopoly and greed. Kongreya Star opened an economic centre for women to plan economic projects and organise women’s co-operatives. The centre has been successful in including many women and employing them in these projects. The centre has also helped many women to get jobs to help their families. A lot of women contributed to the co-operatives and economic projects with small amounts money, each according to their financial capabilities, to benefit later from dividends. Members of Kongreya Star, for example, opened a dairy factory in Qamishlo, after its success in Derik. Livestock is an important part of the economy. Livestock comes second in importance after agriculture in Jazira Canton, because of its positive impact on the economy and standards of living, especially during the crisis that the whole region has been going through. Many people living in rural areas raise many kinds of livestock, such as sheep, goats and cows, and we can say that animal husbandry is part of the popular heritage of the people of the region. Livestock is still the economic driving force of the region. During the last five years, livestock products brought foreign currency into the region, which stimulated the economy. Livestock products are strong competitors to any other kinds of products, and the region is famous for providing crude material for other products, like leather, wool, milk, butter and fat. Organisations of civil society have formed several trade unions, one of which is the Union of Meat Traders, and one of its objectives is to regulate the work of meat traders and butchers and solve their problems, however the unions haven’t met the expectations of the organisers, therefore the Council of Municipalities included them for a period of time until the Chamber of Commerce and Industry was ready. All the trade unions have joined the Chamber, which prioritised the livestock and meat trade in Qamishlo, and also realised that random trading of meat causes many problems for the livestock and spreads diseases. One of the economic achievements of the Rojava Revolution is the formation of the Fuel Administration. The administrators were appointed in a meeting organised by the Council of Municipalities and the Environment in Jazira. Their tasks are to to coordinate with SADKOP, the Jazira fuel company, to manage the distribution of all kinds of fuel, find practical solutions for the problems of distributing gas and petrol, regulate the working of the fuel manufacturing plants that used to work freely, after they had been ordered to stop working, and include them in the fuel administration and co-ordinate with their owners. Crude oil used to be refined, and mazut (heating oil) would be be extracted, then shipped to Jazira and distributed according to people’s needs, but the owners of fuel manufacturing plants started to monopolise mazut and sell it at high prices, therefore the fuel administration made these decisions to stop the exploitation of people, reach solutions for the oil crisis and make mazut available for everyone. The Agricultural Project Co-operative was formed last year with the participation of 35 women in Qamishlo and 60 women in Tirbespiye. The project was implemented on some agricultural land with an area of 4,000 dunams [decares] between Qamishlo and Tirbespiye. The price of a share was 50,000 SYP [Syrian Pounds]. In Serekaniye, 154 women participated, the area of the land was 5,000 dunams, and the price of a share was 30,000 SYP, considering the poverty that the people suffer there. In Derbesiye‎, 270 women participated, the area of land was 5,000 dunams and the price of a share was 25,000 SYP, also considering the situation of the region after the attacks of the mercenaries. In Amuda, 198 women participated, the area of land was 5,000 dunams and the price of a share was 25,000 SYP. In Derik, 135 women participated, the area of land was 3,800 dunams and the price of a share was 60,000 SYP. There has been an advance of sewing and embroidery workshops that work in coordination with one another in Rmelan, Derik and Qamishlo. Every workshop produces specific kinds of clothes. The Rmelan workshop designs and tailors the clothes and then sends them to Warshin workshop in Qamishlo to sew them. The workshops also get work from private organisations and embroider special logos for them. The number of members and the amount of production vary according to demand. The Agricultural Committee have had several activities and projects that have improved the communal economy, and they have been supporting agricultural projects and distributing seeds to the farmers. The agricultural sector has the utmost importance in the economy, and plays a prominent role in the economic development and food security. It provides a living for a huge amount of people, providing the industrial sector the raw materials that are necessary for industrial development, and creating a sense of attachment to the land and the country for the people . The Economic Committee in Jazira has been working on many economic projects in coordination with the Centre for Economic Development, The Movement for a Democratic Society [TEV-DEM], and the Institution of Civil Society [SCS], to work hand in hand to improve the economy. Some projects are still being studied and other projects are being implemented to create jobs and reduce unemployment. The Economic Committee has a lot of projects that encourage the communal economy, such as projects to renovate factories and small workshops, and also livestock and poultry projects. The Committee gives loans to farmers, and its goal is not to make a profit, but to support them and satisfy people’s needs. The Council of Energy has had many activities since the declaration of the Democratic Self-Administration in Rojava, and the formation of many councils which are concerned with securing the basic needs of the people and rebuilding the infrastructure, in spite of the combat in the region, and the attacks of the mercenaries on water-rich areas, which is also causing the electricity to cut out. The Union of Factories And Workshops has opened around 60 private and public factories and workshops in Jazira, The investors are managing and operating them. Many public factories have been opened to support the local economy in Rojava and to employ as many people as possible. One of the factories that the Self Administration has opened is the plastic bag factory in Amuda. The food company Lorîn is one of the important projects that have been successful. It employs a lot of women who make jams, dried vegetables and winter foods, like makdous and pickles. The women also make food for the YPG/J. Hevgirtin buys products from Lorîn and sells them to the co-operative societies, which bring them to the consumers at affordable prices. An office has been opened in Jazira to activate and manage this important sector. Since the beginning of 2017, and in a short period of time, it has done a lot of work to develop livestock, diagnose and treat diseases, distribute vaccines and provide laboratories with appropriate equipment. The veterinary quarantines are important and distinctive projects which are under implementation. They will be located at border crossings in Jazira, such as Simalka and Qantari. There are livestock offices in some cities, and they have veterinary doctors who examine the livestock and medications that enter Rojava, to prevent diseases from spreading. 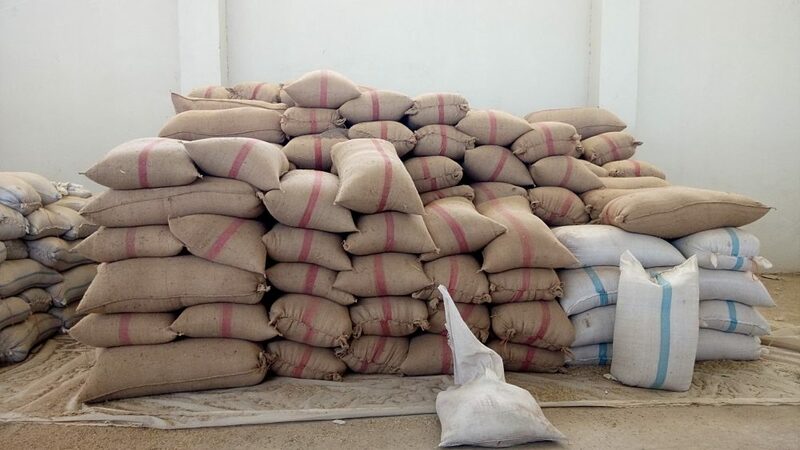 Since the beginning of the crisis in Syria, a lot of medications and meat which are either expired or damaged because of long exposure to the sun have been smuggled into the region from Bashur [South Kurdistan / North Iraq] and Syria’s interior. The quarantine takes samples from medications, tests them and stores them in places at the right temperatures. The entry of trucks has also been regulated, using seals and official paperwork. All kinds of meat that enter the region will be through the quarantine and the veterinary pharmacy. The Union of Agricultural Engineers was formed in the districts of Jazira on 24 November, 2016. Since then, the Union has had many activities, such as training courses of agricultural engineering and the opening of nine offices, one in each district. The United Nations Development Programme and the Municipality of Qamishlo started a co-ordinated project in the region of Jamaya to compost animal manure as an alternative to chemical fertiliser. This project will become an example for cattle breeders, create jobs for many people and increase the fertility of the land in a natural way. The region of Jamaya has a lot of cattle breeding, and there are many complaints of the bad smell because of the accumulation of animal waste, which can cause many diseases, such as leishmaniasis. The project is more about education than economics.